Incoming European Commission President Jose Manuel Barroso says he has finalised a new team, including Italian Foreign Minister Franco Frattini. Mr Frattini replaces Rocco Buttiglione as candidate for commissioner for Justice, Freedom and Security. Mr Buttiglione withdrew to resolve a row with the EU Parliament, after MEPs objected to his conservative views on gay people and the role of women. Mr Barroso said he would present his team to the EU Parliament on Friday. He is in Brussels with EU leaders for a two-day summit focusing on economic reforms. Dutch Prime Minister Jan Peter Balkenende, the EU's current chairman, praised Mr Barroso's new line-up. 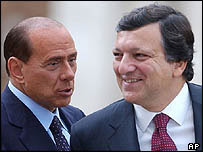 "We hope that Mr Barroso can quickly get down to work with his new team," he told a news conference. The new commission - which was due to have taken office on Monday - has been in limbo due to the standoff. Mr Barroso was forced to withdraw his original line-up last week after MEPs threatened to veto the entire proposed commission if Mr Buttiglione stayed. They do not have the power to reject candidates individually. "We are now back on track. We need to get back to work quickly," said Mr Barroso, quoted by Reuters news agency. He said that Hungarian Laszlo Kovacs would switch from commissioner for energy to taxation and the new Latvian nominee, Andris Piebalgs, would take the energy post. MEPs had doubts about the Hungarian, who failed to convince his hearing he had sufficient knowledge about the energy sector. Dutchwoman Neelie Kroes would keep the competition portfolio, Mr Barroso added. "I see no need to change Mrs Kroes' portfolio. She's an excellent candidate, she brings with her valuable experience," Mr Barroso said. Mr Barroso clearly believes that this time he has a team that will win parliament's approval, the BBC's Tim Franks reports from Brussels. 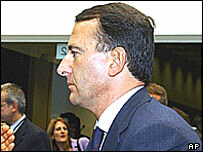 Mr Frattini is seen as a safe pair of hands, correspondents say. He is also nominated to serve as one of the vice presidents of the commission. After hearings for the new candidates, Mr Barroso is expected to put his team to the parliamentary vote during the session of 15 November, the Associated Press reports.